As president, Trump is disconnected from reality and says things he wants to say, but it has consequences because he is currently the President of the United States and whatever he says —or tweets— the press, Congress, and Senate must take him seriously, not as they’d take a tabloid character. 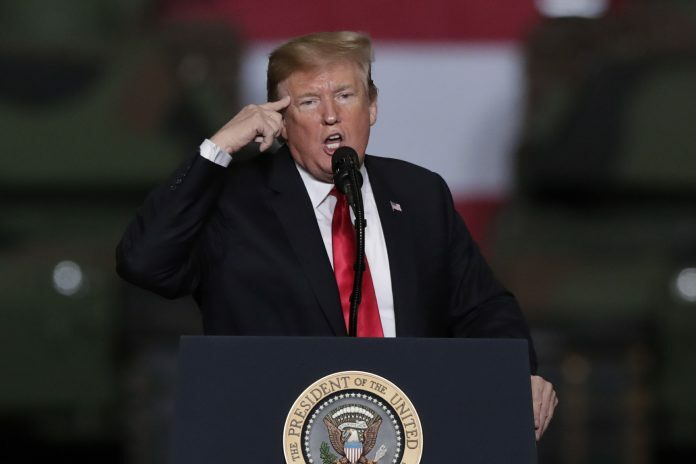 President Donald Trump went to Lima, Ohio, on Wednesday and casting aside rare censure from Republican lawmakers, he dedicated almost five minutes of his speech aiming new blasts of attacks at the late John McCain. It was his feud with the late senator that seemed to be in his mind not his economic promises, although he managed to squeeze a few lines about his economics in the true nature of a tabloid character and giving misleading information on the manufacturing jobs. President Trump has shifted target –not a wall apparently. His recent Twitter attacks have chiefly landed on George Conway, the husband of his advisor Kellyanne Conway and the late Senator John McCain. Of course, Sen. Mitt Romney, as many in the Republican Party, can’t seem to understand —now— because they —now— are also part of an enabling GOP that continues to choose to stand with a president who doesn’t reflect the values John McCain helped build in this country. As a Republican, John McCain also wanted to repeal Obamacare, but he only voted against his party because of the way it [the skinny repeal] was handled, just with the sole purpose to give the president a victory. If alive, most likely McCain would have voted along with the other 12 GOP Senators (of which Sen. Mitt Romney was not one) who supported an effort by Congress to block the emergency declaration Trump had used to circumvent lawmakers as he tried to shake loose funds for his long-promised wall along the U.S.-Mexico border. As president, Trump is disconnected from reality and says things he wants to say, in the moment he wants to say it, and at times what he says doesn’t particularly have meaning, but it is a continuation of a need to talk about himself. And that has consequences because Donald Trump is currently the President of the United States and whatever he says —or tweets— the press must take him seriously, not as they’d take a tabloid character. So must do all senators. And as to the president, manufacturing jobs are not coming back in record numbers. Manufacturing jobs have increased lightly but not necessarily due to this administration’s policies and voters in Ohio might be feeling that because a poll from POLITICO/Morning Consult shows that Donald Trump’s net approval job in Ohio has fallen by 19 points since he took office in January 2017. Might that be due to the fact that manufacturing jobs are still leaving Ohio, like in the case of Lordstown where a General Motors plant is shutting down this month, leaving 1,600 without jobs. The Federal Reserve Chairman has given a much less optimistic forecast than what the president and the White House keep saying. Data collected since September 2018 shows that growth is slowing more than expected and while conditions have been eased, they remain less supportive of growth than what they used to be during 2018. But what would a tabloid character say?